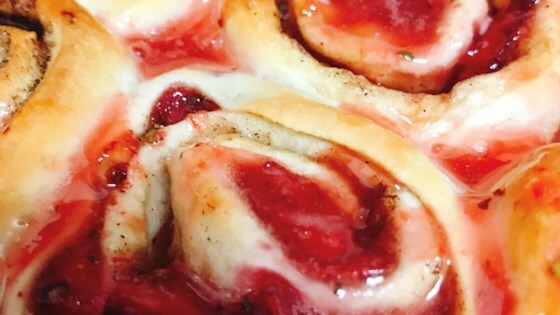 "Add a pop of strawberry pink to the typical cinnamon roll... perfect for brunch or Valentine's Day!" Combine water, sugar, and yeast in the bowl of a stand mixer. Allow yeast to bloom until foamy, about 10 minutes. Gradually add flour to the yeast mixture. Heat butter in a small microwave-safe bowl until melted; add to the flour mixture. Add egg and salt. Mix until a soft, sticky dough forms. Transfer dough to the counter and cover with plastic wrap. Let rest until doubled in size, about 1 hour. Roll dough out to a 9x16-inch rectangle on a lightly floured surface. Spread butter on top. Mix brown sugar and cinnamon together in a small bowl; sprinkle over butter. Roll up dough tightly. Cut into 12 pieces. Preheat the oven to 375 degrees F (190 degrees C). Lightly grease a 9x13-inch baking dish. Place rolls in the baking dish. Gently cover with a piece of foil. Allow rolls to rise in a warm area, about 25 minutes. Uncover rolls and bake in the preheated oven until centers are lightly golden brown, 15 to 18 minutes. While rolls are cooling slightly, prepare the glaze. Combine powdered sugar, strawberry puree, vanilla extract, and salt; beat by hand or with an electric mixer until smooth. Spread over the tops of the rolls.